My kids are always asking me which holiday is my favorite. I always struggle to pick just one favorite, I love them all. They all have something quirky, fun or fabulous that make them worth celebrating. Take Valentine’s Day for example, I love the silly puns, corny cards and chocolate! And since it will be here before you know it I thought it was time to start sharing some new projects, printables and parties starting with these wild Won’t ZOO Be Mine Valentines. A couple of years ago I went wild buying a whole bunch of different treat bags for all occasions. Of course they eventually got buried under new projects and forgotten. But while I was preparing some neighbor gifts for Christmas, I rediscovered these adorable heart bags I’d picked up at the local party store. Using my trusty Cricut, I designed an easy topper and ta-dah…instant cute and simple valentines for your kids, friends or teachers! 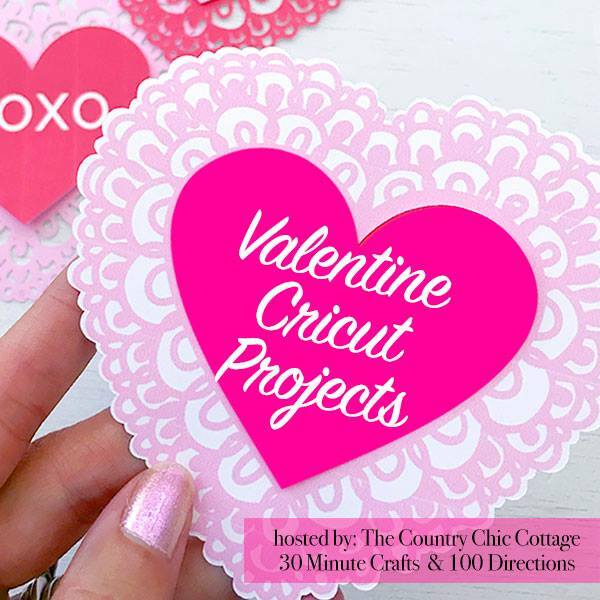 I’ve also joined several of my fellow Cricut bloggers to share lots of creative ideas you can make with your Cricut this Valentine’s Day, make sure you check out all of the ideas below. I love being able to write my message and cut all in a single step. It is so versatile and easy to change sayings and fonts. I started with the small square shape from the Hopeless Romantic cartridge (File#M143D4C2) and expanded it to 6 inches to fit my bag. I then added a score line in the middle to make folding easier. I used the Fontastic Font DJ Terrific to write the saying making sure that I went to the “edit” button to change the style to “Writing”. Next I went to the “Actions” button and hit Attach. This insured that my saying would print and the image would cut in one pass through the machine. The little heart on the left of the topper was made with Heart Card from the Life’s a Party Cartridge (File#M3F143). I cut this about 3 inches wide. I could have added text here too, but since I’m making several treat bags, I figured it would be easier just to hand write the personal greeting. I chose to fill my treat bags with frosted animal crackers so I could use the “Won’t Zoo Be Mine?” saying, but if you wanted a non-food treat you could fill the bag with plastic toy zoo animals. From design to finished bags, the whole project only took me about 30 minutes! As a blogger it’s my job to constantly be working on ideas and come up with creative projects that inspire others. But, sometimes in the process of trying to deliver one-of-a-kind ideas I forget how much I love a quick, simple and easy project that isn’t overly complicated. Sometimes you just need simple…and frosted animal crackers! This actually turned out pretty cute. You do such a great job with the photography. Like the link to other projects too!